Special Order No. 13-2018 - Inre: Notice to jurisdictional utilities to immediately track and record, as of January 1, 2018, the impacts of the Tax Cuts and Jobs Act as a regulatory liability and opening a rulemaking docket regarding same. Special Order No. 09-2017 - Executive Orders dated August 17, 2016 and August 19, 2016 - (Customer disconnect format). Notice: The Louisiana Public Service Commission has been alerted of another possible scam on electric utility customers, this time Entergy customers. Commissioner Lambert Boissiere of District 3 was called by a customer stating that he had received a call from an individual stating that they must pay their electric bill that day or their power would be cut off. The Commission will be investigating these calls but would like everyone to be vigilant and not release any personal information or attempt to make a payment with these individuals. Any questions should be directed to the utility company and the Commission. 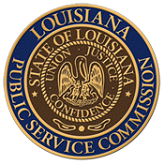 If you are moving household goods from one location within Louisiana to another location within Louisiana, the move is regulated by the Louisiana Public Service Commission (“LPSC”). Please ensure that the mover you have retained to move your household goods is registered and in good standing with the LPSC. You may contact the Transportation Division of the LPSC with any further questions before your move. In the event that you experienced sub-standard service during your move or you have discovered that the mover you retained was not registered with the LPSC, you may file a complaint with the Transportation Division and an investigation will be opened. CLICK HERE FOR MORE DETAILS. A customer or applicant that has been determined to be a victim of family violence as defined in the La. R.S. 46:2121.1 by treating medical personnel, by law enforcement personnel, by the office of a District Attorney, by the office of the Attorney General, or by a designated representative of a family violence program established under the La. R.S. 46:2122, et seq. shall be exempt from the utilities initial credit and/or deposit requirements as established in that utility's tariff. This determination shall be evidenced by submission of a certification letter to the utility. The certification letter must be printed on the letterhead of the certifying agency or accompanied by a letter on agency letterhead identifying the certifying individual. The certification letter expires after ninety (90) days. Docket No. R-29900 In re: Credit and Deposit Requirements for Victims of Family Violence. Disconnection of gas and electric services. The following General Orders address disconnection of gas and electric service to customers during periods of extreme weather. Intiate New Service after Termination of Service for 3 years. Prohibition against termination of or denial of service by a providing utility to a customer or potential customer based on failure to pay for charges incurred on an account for services, where the account has been closed with no further charges or payments made on the account for a period of three years or more. Prohibition against terminiation of service by a providing utility against a consuming utility. Prohibition against termination of service by a providing utility against a consuming utility absent notice to the affected Commission District and Main office and an opportunity to eliminate the cause for termination. This order describes the required procedure for terminating service by a providing utility against a consuming utility. Delinquent Penalty for Non-Payment of Utility Bills. Amendment of General Order of February 20, 1973. This order clarifies the Commission's intention with respect to delinquent penalties for non-payment of utility bills. Penalty charges for deliquent payment of utility bills. Amendment of General Order dated November 16, 1972, Penalty charges for delinquent payment of utility bills. All utilities subject to the jurisdiction of this Commissision shall limit any penalties for delinquent payment of utility bills to not more than five per cent (5%) of the actual billing, said penalty to apply not less than 20 days from the date of billing.